It's Wild and Wonderful Release Day at Catherine Pooler Designs! Two FABULOUS new ink colours are now available along with some beautiful stamps and dies that will be sure to become staples in your collection! Today is a blog hop, so be sure to scroll to the end and click on the next blog to check out more inspiration! 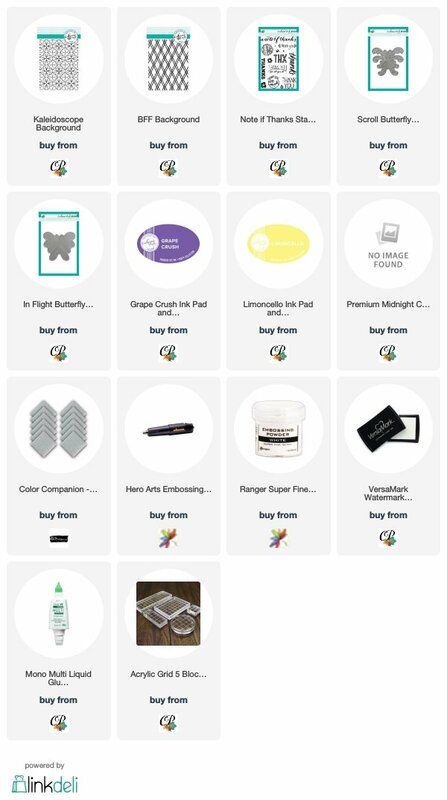 5 random winners will be chosen to receive 2 ink pads (and free shipping) May 25th. You must comment for a chance to win. You will find the winners on Catherine's Blog. For this card, I embossed the Kaleidoscope background stamp using white embossing powder. I die cut the In Flight Butterfly from the center and die cut it again in silver glitter paper. I added the Scroll Butterfly die which coordinates perfectly in the center for some added detail! Some cards, in my opinion, are better off without a sentiment. This allows me to add an appropriate sentiment last minute on the inside. This card is very plain and simple but I wanted to show off the new ink colours, Grape Crush and Limoncello. Both are super vibrant and stamp perfectly the first time! The BFF Background is a beautiful background stamp that is perfect for any occasion. Both are beautiful Justine! Love these new background stamps! The butterfly card is so elegant & love the sparkle. together on the 2nd card. the butterflies are so unique, I love them layered up! Both cards are very pretty!! 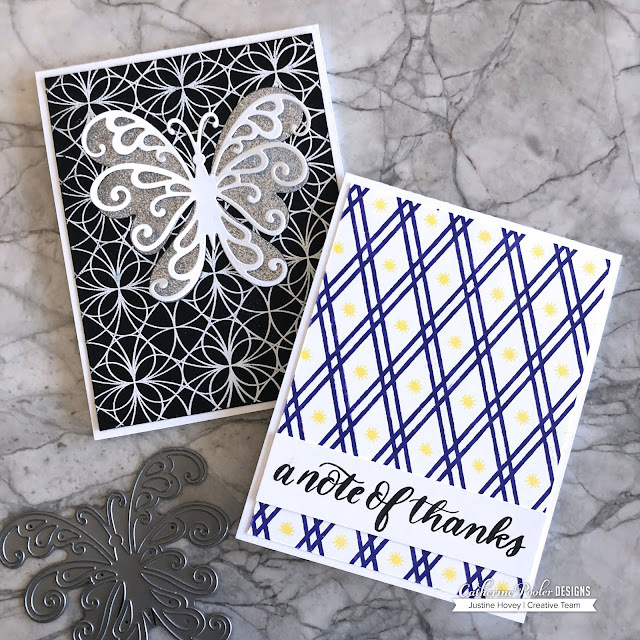 Love your cards, especially the elegant butterfly card. I am gaga over these background stamps and how you used them. Fabulous! I’m excited about the background stamps, your cards are lovely! Beautiful cards, Justine! I love how the scroll butterfly looks against that glitter paper. What a cool idea for the butterfly. Nice 3D effect. Your cards don’t look simple, they are gorgeous. The butterfly dies look great with the kaleidoscope background. Love the classic look of the black, white, and silver. The inks ink colors are fabulous. The BFF background is definitely gives a great graphic look. So many great cards from this release. That background stamp is calling my name. I love how you added the accent in between the lines! I like that simple background stamp. I think it would be cute with hearts stamped in the middle. Wow, the butterfly really seems to highlight the lines of the stained glass background. Beautiful cards, Justine. Love how you did the butterfly on the first one. Thanks for sharing! A wonderful way to use the butterfly! Love the way you did the butterfly on the first card!! Fabulous cards Justine! One lovely and elegant the other fun and happy. great cards. The black and white background/butterfly is stunning. Your cards are wonderful as always and thanks for the video. Love both of your cards, but your butterfly is so elegant. Love the butterfly card, gorgeous! BFF stamp is awesome! It looks so nice and versatile. I just had to order the butterfly today. Should have ju st ordered with my other stuff yesterday...sigh. Justine, your cards a so beautiful. Thank you so much for sharing, can't wait to put in an order such wonderful line of products and love the new ink colors also. Can’t wait for the BFF background. Great cards! I am loving the BFF background using the two new ink colors. thanks for taking the time to video and provide instruction. Beauties! I love the way you kept the cards simple and focused on the background design and color of the new inks! Gorgeous! I love the grape crush and lemon cello combination. Great cards - I especially like the Grape Crush and Limoncello, great background. Beautiful cards! I especially like the butterfly one! 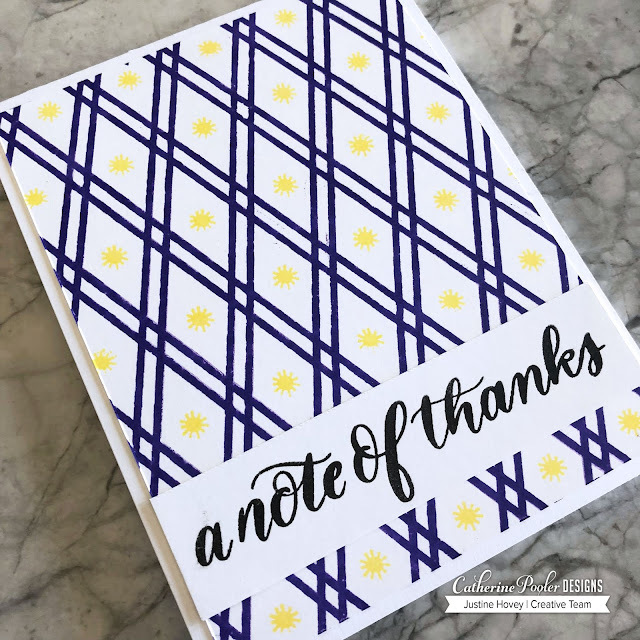 I just can't get enough of that kaleidoscope stamp! there are so many awesome ways to use it! I love both of your cards but that first butterfly one is my favorite. You could make a whole set with different background paper or different glitter paper! Love it!! Thanks for sharing. Love the butterfly card. Thanks for doing a video to show us how you did it. Wonderful cards. I really like the one with the butterfly. I just loved how you used glittery butterfly cut out with white butterfly so it would stand out from kaleidoscope background. Love your cards! That silver butterfly on the Kaleidoscope background--amazing! Thanks so much for sharing! 2 very beautiful cards Justine that seemed very easy to do. Loving the 2 new ink colors and all of the CP background stamps! Thanks for sharing. Awesome cards! Very striking but still easy to create! I love your cards. Always so creative. This collection release is amazing. I truly Loooove that gorgeous butterfly card! Awesome design! Love the new colors a lot! Loving this butterfly, and the whole release! Love the butterfly on the first one. Thanks for the chance to win. Beautiful cards!!! Your first one is very elegant!!! That BFF Background is calling my name. Elegant! Anybody would be proud to give and receive these cards!! 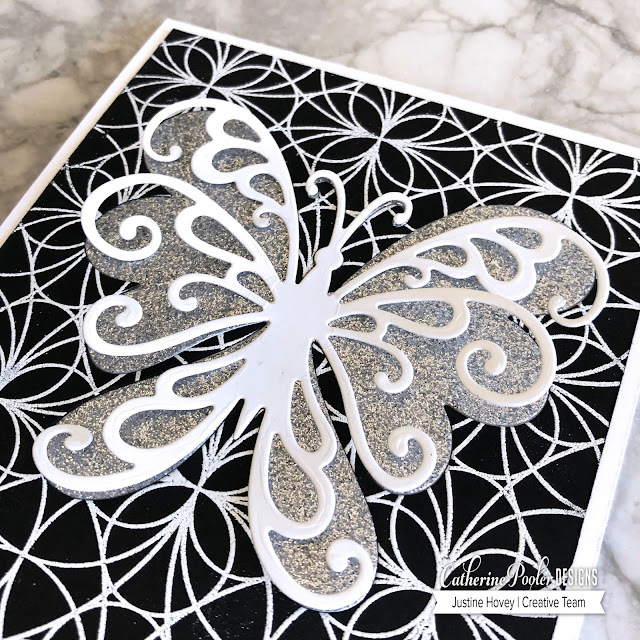 Love that butterfly card with the black and white color combo. I love the butterfly card! Wow! Love your cards! Great ideas to CASE when my new stamps arrive! Justine, As usual I love your cards! You always blow me away with your creativity! I hadn't realized how wonderful those two butterfly dies would work together! The black and white background is stunning! The second card is fantastic, as well. Both of these backgrounds are fabulous and need to be in my collection! Thanks for sharing your creativity and talent with us! Love the black and white...classically beautiful! They are both nice but I like the note of thanks... Clean! Wonderful cards. Love the butterfly. WOW!!! Justine, really wonderful cards :) I'd have a hard time choosing a favorite! Thanks for sharing! Awesome background stamps! Love the butterfly too! Beautiful cards! Such a great release! Love what you did with the beautiful butterfly die. Thanks for the inspiration. 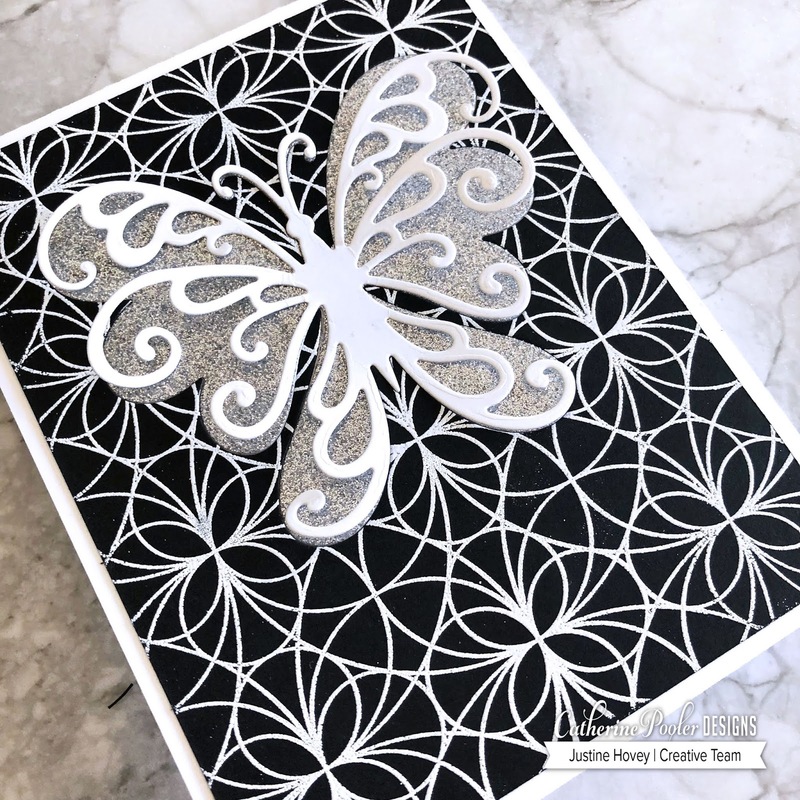 Your two cards are great but the black and white butterfly is so elegant !! LOVE that butterfly card Justine - so pretty! And filling in those spaces on the BFF card is such a great idea! These are beautiful and that butterfly card is just stunning! Thanks for sharing with us!! Beautiful cards. The butterfly cards is striking. The first card is so refreshing and a polished elegant contrast interpretation of the rainbow effect I recall in the previous works of this blog hop. It is a great inspiration to see a different approach and ignites ideas for the background in new directions. All of you blow my mind! Gorgeous card. Especially the butterfly one. Really love both backgrounds! I especially love how awesome the glitter paper looks with the black and white pattern.